So come the weekend I should hopefully be off camping but I have two problems. One I have yet to sort my luggage options for the Kawasaki Z250SL and two Ren my satnav will not be leading me to my chosen destination. Arghhhh! So I better sort myself out and tackle these issues. First things first...luggage. 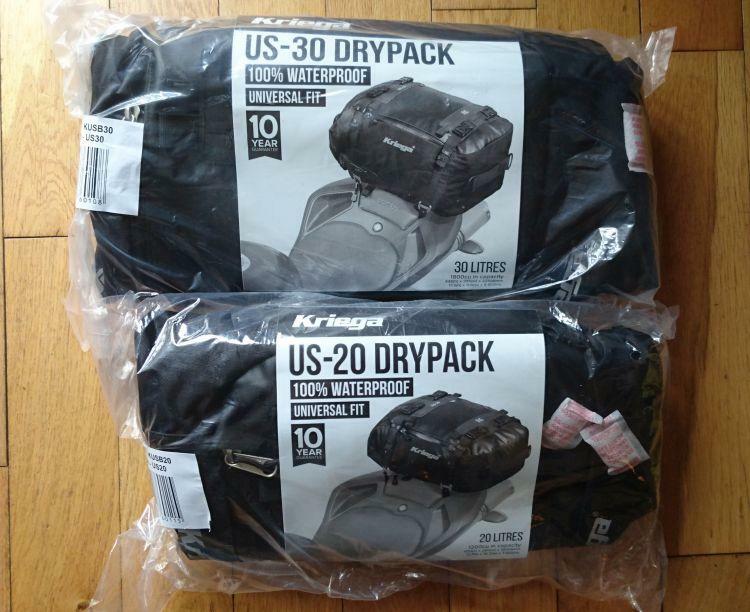 If you are a regular reader you will know I recently acquired a second hand Kriega US 20 Drypack. 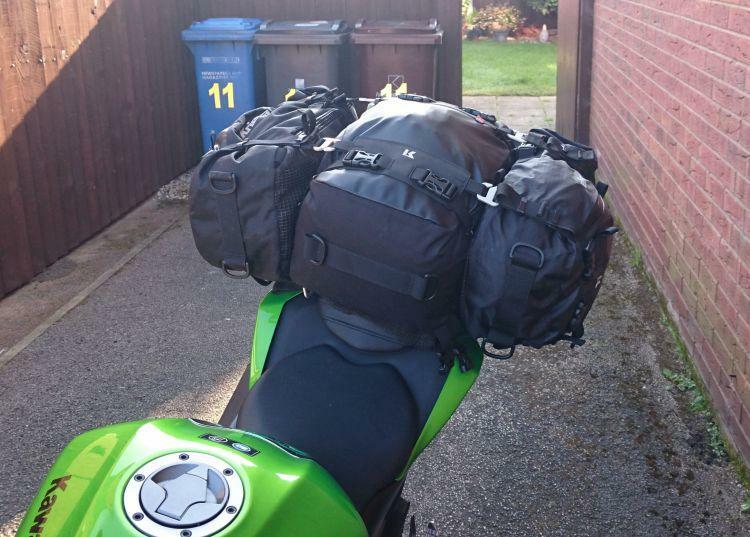 I have been most impressed with it and have therefore endeavoured to purchase further used Kriega luggage. Sadly to no avail. Why? Because silly people bid silly prices for second hand Kriega, practically up to full price...why people whyyyy.??? Some have straps missing, some are the older type without the alloy hooks or quick release but still the prices go up,up,up. In the end I gave up on the madness and decided for the sake of £20 extra I would purchase brand new and get myself not only a shiny new one but get its 10 year guarantee along with it. Not that this was an easy decision. It made my purse weep and my bank balance bleed as it haemorrhaged cash. Kriega is not cheap and I am not rich. An unlucky alliance but after nearly a year of searching for luggage I had found the only answer I was happy with. Pity it is a very expensive solution but hey ho. I can blame my devil may care attitude on my tumour. Why the hell not, this pain in my side has to come with some benefits. If my riding days may be numbered then why not enjoy what time there is riding in the style I would love to become accustomed to. See I can never just buy anything just because I want it. I have to argue with myself, plead with myself and justify it. Ahhh shut it Sharon, spoil yourself and press the buy it button. My finger hovvers...sheeezzz it's not WW3 for heavens sake, I am not about to deploy mass destruction on mankind. No just create a rather large hole in my small savings that's all...press it....press it...I am beginning to sweat now.. Annddddd the deed is done. Phewww. OK I confess in my moment of sheer reckless indulgence I purchase not one but two new Kriega bags. Another 20 litre and a larger 30 litre. This will give me the full 70 litre capacity combo I have lusted after since first seeing it. Very out of breath I gasp to Postman hopefully "You got my parcel?" No he grunts that would have been on the van. NOOOOOOO! Dejected and deflated I trudge home, woe, oh woe is me. With a heavy heart and rasping breaths I lift my key to the door and what do I see - passing my road? Only the bloody post van. Here we go again. Run Forest run! I give chase waving my arms around like a lunatic. The van stops, was in my frantic waving? No he has stopped to pick up the grunt pulling the trolley. Nice one pal thanks for telling me the van was going to pick you up, could have saved me a near heart attack. I demand my parcel be released from the confines of the van. The door opens upon bags and bags of parcels. The van driver looks forlorn, it's there somewhere he says sadly but I don't know where. Bloody hell this could take sometime, but what do I see? A parcel with tape wrapped around it on which is a picture of a motorbike. I begin to jump up and down again like a lunatic. "That be mine that be mine!" I squeal. It is indeed mine. OK so I lost my breath and my dignity but I gained Kriega....YESSSSSSS...success is mine, well the bags are at least. These beauties will leave you breathless. Well they will if you have to chase the delivery van. Once back home I open up my parcel and just sit for awhile admiring my new beautiful luggage. Well ok so I needed some time to get my heart rate back to normal, I'm getting on you know. Once rested I begin to pack. My big fat sleeping bag would not fit into the Kriega US 20. I am therefore hoping it will fit in the 30. It does..just..with a bit of squeezing and coaxing. The lilo, pillow and fleece liner all follow and that's the 30 litre packed. These leaves the two 20s free for clothes, toiletries etc. Fantastic it all fits easily enough. I fit the 30 onto the back seat. The hooks easily attach to the web loops. The 20s now attach either side of the middle 30 litre bag. It really is a most amazing piece of kit. Yes it is expensive but when you see it in action it is a sight to behold. It all clicks together perfectly. This really is British design and quality at its very best. I can not stop smiling as even loose strap ends have attachments to tidy them away. It all looks so neat and tidy. 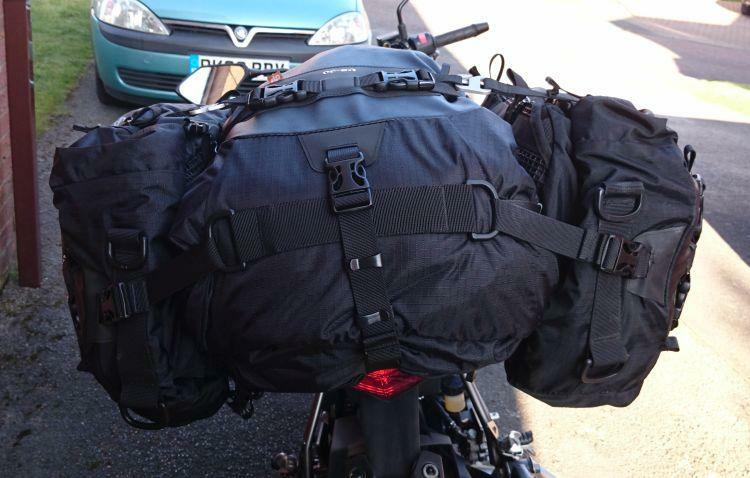 It is so easy to connect together and it is an absolute joy to load up my bike with this Kriega luggage. It is like a bit of magic the way it just holds itself together without sagging. The only concern I have is the combo does have a slight side to side movement due to my super skinny back seat. However I remind myself that it is attached to the subframe so it should in theory be just fine. There us only one way to be sure and that us to put it to the test on a motorway. That will be Saturday's task. For now I unhook the luggage from the bike with ease and smile some more. So far so very happy with my new luggage. Click, click and your done. As long as the luggage stays attached to my bike on my camping trip this may indeed be luggage problem solved. Keep tuned folks for this answer and how I get on with problem two. What's your thoughts regarding Sharon's luggage? Do you have any suggestions of your own? Please feel free to comment below or if you have your own packing tip, luggage ideas or fabulous solutions we'd love to share it as an article on here. Click Here. Might help spread the load. A TEA TRAY! Oh Doug. Have you ever read Zen and the Art of Motorcycle Maintenance? I would use a tea tray if it made sense to use one but I'm not sure Sharon would allow such things. I have offered to install a piece of metal transversely under the tail-light bracket to offer some additional side-to-side stability but this has been rejected too. Don't hold out too much hope for your tea-tray solution Doug. ...THAT...is an abso-bleedin-lutely FANTASTIC idea!!! Needs a little revision. Touratech not Givi. "Adventure Platform" instead of luggage platform. We need a handsome couple dressed in Klim bike gear stood next to a GS1200 in a sunny forest scene. He's busy strapping kit to the "Adventure Platfrom" while she's looking into the beautiful wildness wistfully. Drop a line to China Doug and order 30,000 of these tea trays. We're going to be millionaires. I have a Kawasaki Z250SL and wanted to fit luggage, Givi make a specific rack but its only available in the far east or Japan. I found a heavy duty Givi rack that takes Monokey or Monolock top boxes. the company is Sim Trading. I went for the Givi E33 top box as it has a removable top that I am in the process of having sprayed in green. There are companies that sell a lightweight version in Japan but your very limited to the weight it can carry. When you search for parts look at Malaysia first, there are hundreds of thousands of bikes sold there and the prices are reasonable and many take PayPal. I'm not going to try buying it though, that's up to Sharon. I suspect she's settled on the Kriega stuff for now. Any other links to luggage would be useful Alan.